The U.S. military filed murder charges Tuesday against Omar Khadr, a Canadian who was 15 when he was captured in Afghanistan and sent to the Guantanamo Bay prison in 2002. Khadr, now 20, also was charged with providing support to terrorism, attempted murder, conspiracy and spying. He faces a military trial at the prison in eastern Cuba under rules adopted last year and first used in March to try Australian detainee David Hicks. Khadr is to be arraigned on the charges within 30 days at the U.S. military's courthouse in Guantanamo Bay, the military said. He faces a maximum penalty of life imprisonment. The Toronto-born Khadr, the son of an alleged al Qaeda financial leader, Ahmad Said al-Khadr, was captured in July 2002 after being badly wounded in a firefight near Khost, an al Qaeda hotbed in eastern Afghanistan. He is charged with throwing a grenade that killed Army Sgt. 1st Class Christopher Speer, 28, of Albuquerque, N.M., and wounded Army Sgt. Layne Morris, of West Jordan, Utah. The murder and attempted murder charges stipulate that the acts were carried out "in violation of the law of war." The wounded soldier and Speer's widow filed a civil lawsuit against Khadr and his father, who authorities believe was killed in Pakistan. In February, a judge awarded them US$102.6 million (euro78.2 million). The military alleges that Khadr also conducted surveillance of U.S. troops in Afghanistan and planted land mines targeting American convoys. Khadr allegedly received a month of one-on-one basic training from an al Qaeda member in June 2002 that included use of rocket-propelled grenades, rifles, pistols and explosives, according to the charge sheet signed by Susan J. Crawford, the convening authority for the military commissions. Khadr's Egyptian-born father, Ahmad Said al-Khadr, was killed in Pakistan in 2003 alongside some senior al Qaeda operatives and Canada is holding his brother Abdullah on a U.S. extradition warrant accusing him of supplying weapons to al Qaeda. In a documentary by the Canadian Broadcasting Corp., another brother, Abdurahman, acknowledged their father and some of his brothers fought for al Qaeda and stayed with the terrorist group's mastermind, Osama bin Laden. In March, the military tribunal at Guantanamo sentenced Hicks to nine months in prison after he pleaded guilty to supporting terrorism — the first conviction at a U.S. war-crimes trial since World War II. Under an agreement with the court, the confessed Taliban-allied gunman will be allowed to serve his sentence in an Australian prison, but must remain silent about any alleged abuse while in custody. Prosecutors say they plan to charge as many as 80 of the 385 men now held at Guantanamo on suspicion of links to al Qaeda or the Taliban. 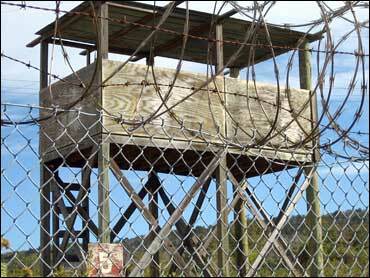 The U.S. Supreme Court in June struck down the previous military tribunal system at Guantanamo as unconstitutional. U.S. President George W. Bush subsequently signed into a law passed by Congress a new military tribunal system. The high court is now considering a challenge to the revised tribunals. Some members of Congress have vowed to repeal the law that limits detainees' access to civilian courts.